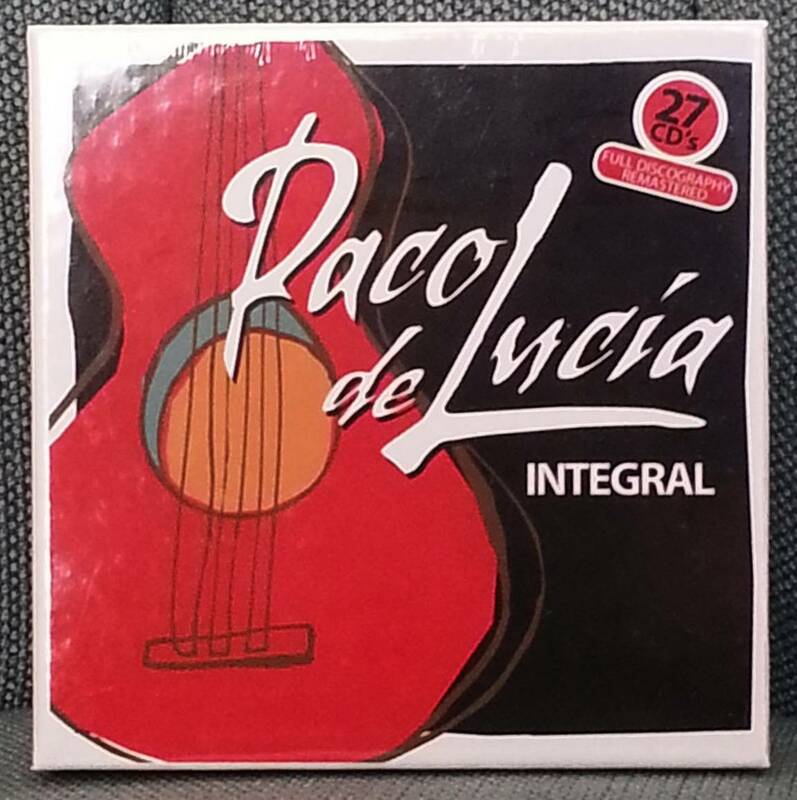 New version of the Paco de Lucía Integral, 27 CDs his complete work remastered. "Cositas Buenas", his last album, comes as a new in this new Integral. Now in a new economic format. This collection is a unique tour of the work of Paco de Lucia from 1964 to 2004. 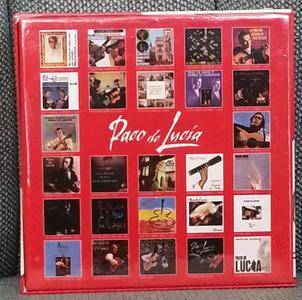 Spanish classical music had always aroused profound interest in Paco de Lucía. 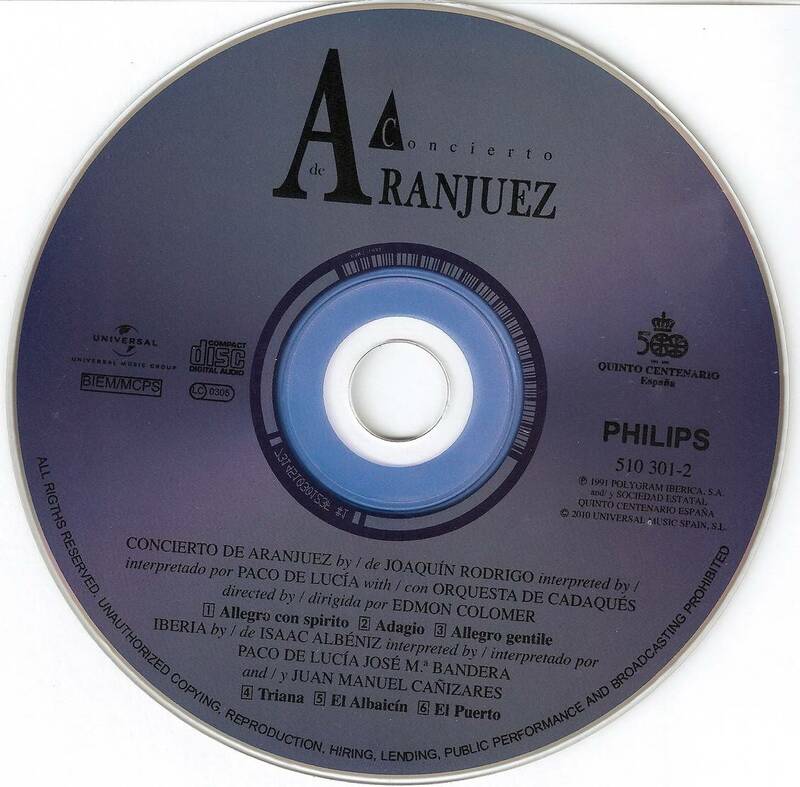 First came the album Lorca (1967), the records of Andalusian and Iberoamerican classics (65-69), afterwards came his magnificent work with Falla (1968) and from 1991 we must add this Concierto de Aranjuez and three pieces from the ‘Suite Iberia’ by Albeniz. His pledge here is clear: to offer out of the most profound respect a new perspective on the Classical Spanish canon, in Flamenco. The traditional and incomprehensible separation between classical Spanish music and Flamenco becomes here one of his most important challenges. The result is a revelation. 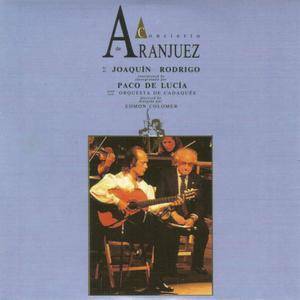 One of the dreams of every guitarist, classical or Flamenco, is to play the most popular piece in Spanish music, that is, the concerto for guitar and orchestra written by Joaquin Rodrigo under the title ‘Concierto de Aranjuez’. The duration of the concerto is not enough for an album, so Paco recorded three pieces, arranged by Juan Manuel Cañizares, taken from the “the high point of universal piano literature” (Messaien), that is ‘Suite Iberia’ by Isaac Albeniz to go with it. 12 pieces dedicated in the main to Andalusia from which were selected (in the opinion of the guitarists) the most easily-adaptable to the Flamenco melos (melody). With the help of the Sociedad Estatal Quinto Centenario he was able to reunite the orchestra of Cadaqués, under the baton of Edmond Colomer, and made the dream come true —a Flamenco guitarist playing Rodrigo’s concerto. As shown on the cover of the album, the composer sat beside the interpreter and this brings to the music a new state, unheard in other versions. 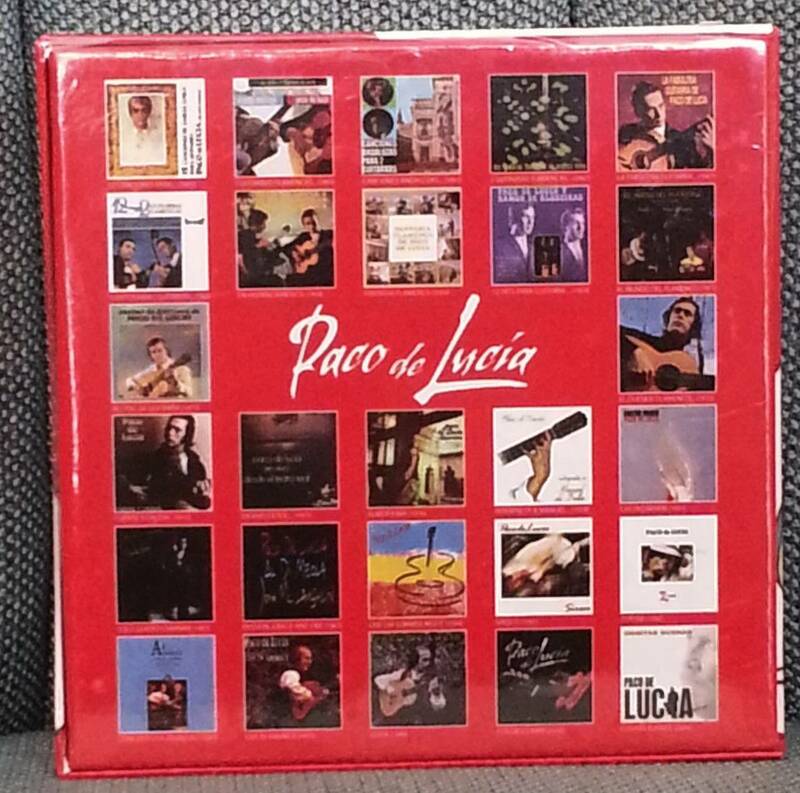 The beat of the Flamenco guitar, the confident and unmistakeable toque of Paco de Lucía gives a new face to this music. Which versions are best is a question of taste, but without doubt this is one of the most original and well-made, above all in the dynamic and the articulation. 01- “Dos guitarras flamencas en stereo” (1964) Ricardo Modrego and Paco de Lucía. 02- “12 canciones de García Lorca para guitarra” (1965) Paco de Lucía and Ricardo Modrego. 03- “12 éxitos para dos guitarras flamencas” (1965) Paco de Lucía and Ricardo Modrego. 04- “La fabulosa guitarra de Paco de Lucía” (1967). 05- “Canciones andaluzas para 2 guitarras” (1967) Paco de Lucía and Ramón de Algeciras. 06- “Dos guitarras flamencas en América latina” (1967) Paco de Lucía and Ramón de Algeciras. 07- “Fantasía flamenca de Paco de Lucía” (1969). 08- “12 hits para 2 guitarras flamencas y orquesta de cuerda (1969) Paco de Lucía and Ramón de Algeciras. 09- “Paco de Lucía y Ramón de Algeciras en Hispanoamérica” (1969). 10- “El mundo del flamenco” (1971). 11- “Recital de guitarra de Paco de Lucía” (1971) with Ramón de Algeciras, Enrique Jiménez De Melchor,Paco Cepero, Isidro de Sanlúcar Muñoz and Julio Vallejo. 12- “El duende flamenco de Paco de Lucía” (1972). 13- “Fuente y Caudal” (1973). 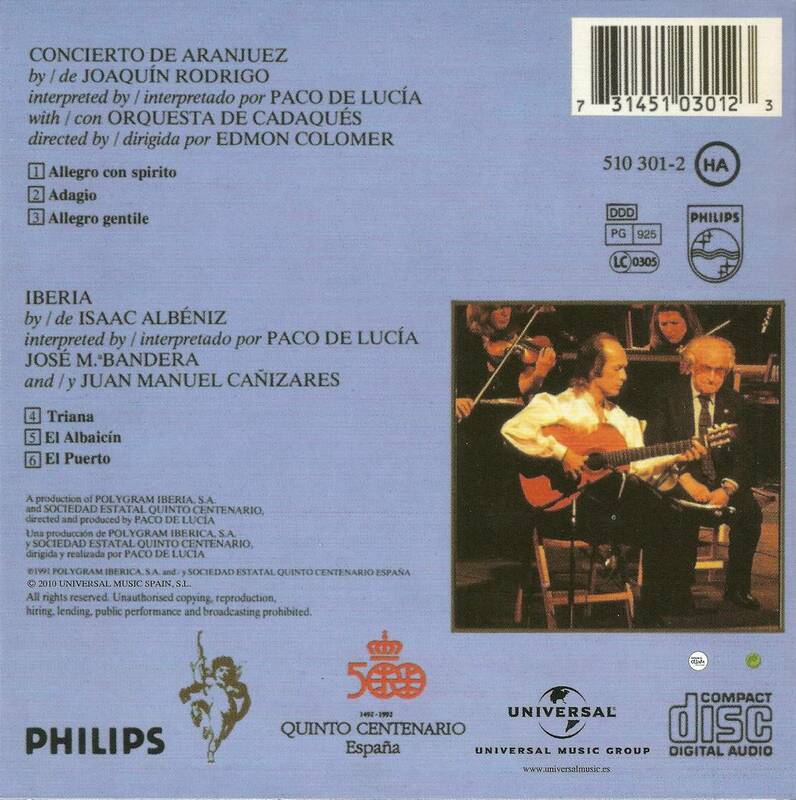 14- “Paco de Lucía en vivo desde el Teatro Real” (1975). 16- “Paco de Lucía interpreta a Manuel de Falla” (1978). 17- “Castro Marín” (1981) seven themes registered in Tokio, two with John Mclaughlin and Larry Coryell. 18- “Sólo quiero caminar” (1981). 19- “Live… One Summer Night” (1984) Alive with The Sextet. 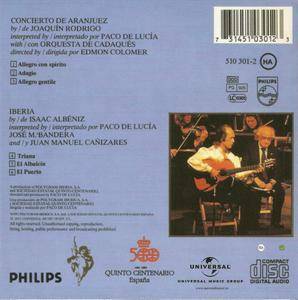 22- “Concierto de Aranjuez - Iberia / Albéniz” (1992). 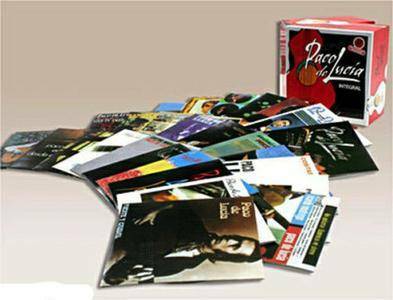 23- "Paco de Lucía & Sextet, “Live in América” (1993) Alive with The Sextet on tour at the United States. 24- “The Guitar Trío” (1996) with John Mclaughlin and Al Di Meola. 26- “Paco de Lucía por descubrir” (1964-1999) first record of Paco de Lucía, EP / 4 toques; alegrías from the record In Memoriam Niño Ricardo; Three themes from the Original Soundtrack of the movie “La Sabina”; one theme from the record of the band “Dolores”; music from the movie “Carmen” by Carlos Saura / Antonio Gades; The sevillanas with Manolo Sanlúcar from the movie “Sevillanas” by Carlos Saura; one theme with Juan Habichuela from the CD “De la zambra al duende”.